He joined the air force in May 1916 as a mechanic. He was incorporated into the 1st Aviation Group in 1917 and earned his fighter pilot’s licence in April 1918. Corporal Gérard was attached to the new squadron named Escadrille SPA 168 in October 1918. On the 30th day of that month, he took part in aerial combat which ended with him shooting down an enemy plane, no doubt a Focker D. VII, the steel fighter plane that was dreaded by Allied pilots. At the age of twenty, he received his first citation. 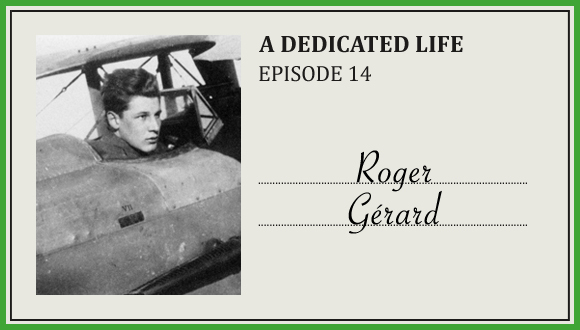 An aviation enthusiast who never stopped flying, he was mobilised as a captain in the Air Force in 1939 and shot down four enemy planes during the French campaign of 1939-1940. After the armistice, he put his knowledge of the aeronautical industry to good use in the Resistance, and very actively served a military intelligence network. He gathered valuable information, in particular about the first jet fighters of Messerschmitt. After the war, he went back to industry while continuing to fly regularly.